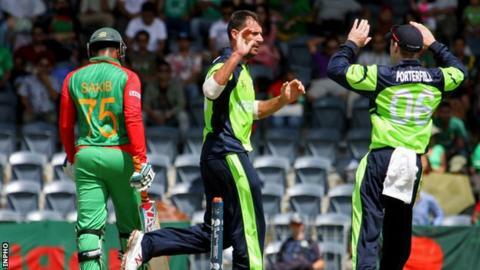 Ireland's men have been drawn in a difficult group alongside Bangladesh in the first phase of next year's ICC World Twenty20 tournament in India. John Bracewell's side will need to top their four-team group, which also contains Netherlands and Oman, if they are to progress to the Super 10 stage. The Super 10 will be played alongside the women's event from 15-28 March. Ireland's women have been drawn in Group A alongside Australia, South Africa, New Zealand and Sri Lanka. Aaron Hamilton's side open their campaign against New Zealand on 18 March, followed by a game against Sri Lanka two days later, with both matches taking place in Mohali. South Africa will provide a tough test for the Irish side in Chennai on 23 March, followed by their final group game against the Australians in New Delhi on 26 March. In the men's competition, Ireland will face hosts India, holders Australia, New Zealand and Pakistan if they reach the Super 10 stage. The winners of the second qualifying group, which comprises Scotland, Zimbabwe, Afghanistan and Hong Kong, will face England, Sri Lanka, South Africa and West Indies. Ireland will be based in Dharamsala and open their campaign against Oman on 9 March, followed by what might prove to be the group decider against Bangladesh two days later. Ireland's final group game against Netherlands takes place on 13 March.